A New Stepping Stone to Happiness! 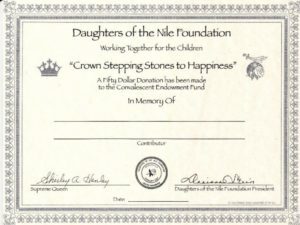 The Daughters of the Nile Foundation is pleased to announce a new Stepping Stone to Happiness. The crown has long been associated with Daughters of the Nile, emblematic of royalty and leadership. 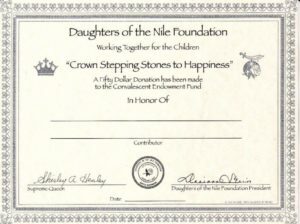 For its historical place in our fraternal organization, the Daughters fo the Nile Foundation Board has chosen a silver crown to decorate a new Stepping Stones to Happiness, which shall be known as the “Crown Stepping Stones to Happiness Certificate. This new Crown certificate, available for a $50.00 donation, can be ordered now through the donfdn.org website or through your Princess Recorder. With the debut of the Crown Certificate, the NOW In Honor Of and In Memory Of certificates have been retired and are no longer available. Be among the first to acquire this new Crown Certificate for yourself or to give to someone else. Shriners Hospitals for Children® through the Daughters of the Nile Foundation. Thank you in advance for your investment in this new Foundation offering.